Devi (Chennai, India) on 11 July 2017 in Plant & Nature and Portfolio. I had posted this long ago..am posting a closeup for the benefit of my friends here. 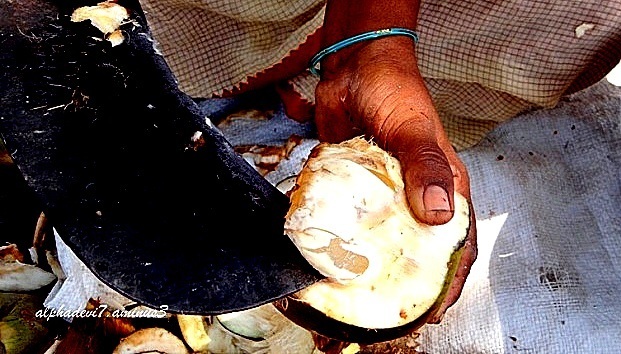 Having cut the palm with a broad sharp knife, the lady is scooping the fruit out. Now, we have to gently remove the white thin skin and you will have a light gray translucent fruit in your palm( ha ha Palm fruit in your palm)..juicy too. Du moment que c'est un fruit cela doit être bon. Wow...the knife ...!! Superb close-up to show us the tradition . Thank you. Great skill using this knife on the fruit Devi. Excellent image. Such a big knife !! Yeah, great skill !! Thank you for explaining and showing me this. That is a big scoop, nice storytelling ! Great close-up shot captured here!! Good shot. I tried the palm fruit for the first Tim least year. I couldn't help but think that it was nature's water bottle! So interesting and dangerous with that big blade. A great image! That is a huge knife! Trèstrèshabolepour couper le fruit quelmachelleet scène.